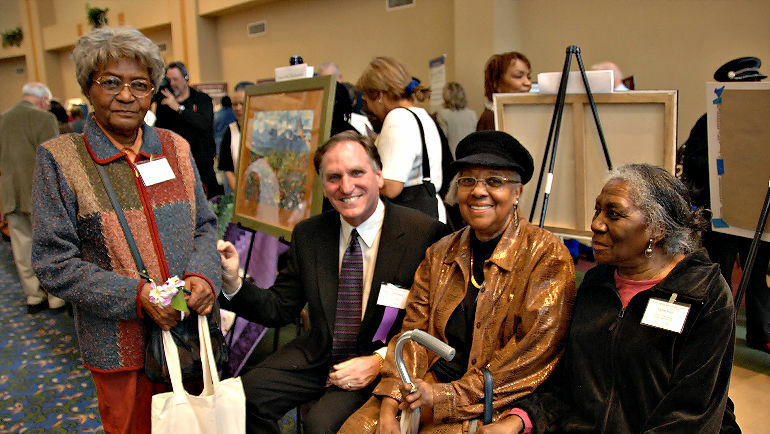 Dr. Peter Lichtenberg (second from left) mingles with a few of the 300 older adults who attend the Institute of Gerontology's annual Art of Aging Successfully conference. Peter Lichtenberg, Ph.D., director of the Institute of Gerontology at Wayne State University, won the 2019 Powell Lawton Distinguished Contribution Award for Clinical Geropsychology from the American Psychological Association (APA). As one of the country’s first-board certified clinical geropsychologists, he has contributed significantly to the practice of older adult psychology in areas including financial exploitation and vulnerability, Alzheimer’s disease, and late-life depression. Lichtenberg has also provided national leadership to geropsychology as a past APA president of the Division on Adult Development and Aging, chair of the Committee on Aging, founding member of the Geropsychology Specialty Board, and several other leadership roles throughout his 33-year career. “Powell Lawton was a role model for me,” Lichtenberg said. “All my research, assessment and training programs are oriented toward providing a direct benefit to older adults, many of them underrepresented and vulnerable.” The Society for Clinical Geropsychology grants the award, which will be presented at the APA’s annual convention in Chicago this August. As a sub-group of the American Psychological Association, the society fosters the mental health and wellness of older adults through science, practice, education and advocacy to advance the field of professional geropsychology. The Lawton Award is one of its highest honors. Lichtenberg is also nationally known for his work on financial decision-making, capacity, vulnerability and undue influence in older adults. He is particularly interested in the intersection between financial capacity and financial exploitation to find ways to balance autonomy and protection for older adults. Lichtenberg recently launched olderadultnestegg.com, a free, easy-to-navigate website that allows professionals in occupations like financial planning and social services to screen and assess their client’s financial decision-making. He has conducted independent medical evaluations and expert witness work over 200 times in the past decade on issues related to older adults, capacity and undue influence. He is the author of nine books, including the APA Handbook of Clinical Geropsychology (2015, a two-volume work), and has authored or co-authored more than 200 peer review journal articles and book chapters. Lichtenberg also directs the Merrill Palmer Skillman Institute for Child & Family Development. The Institute of Gerontology researches aging, educates students in gerontology, and presents programs on aging issues relevant to professionals, caregivers and older adults in the community (iog.wayne.edu). The institute is part of the Division of Research at Wayne State University, one of the nation’s pre-eminent public research institutions in an urban setting. For more information about research at Wayne State University, visit research.wayne.edu.